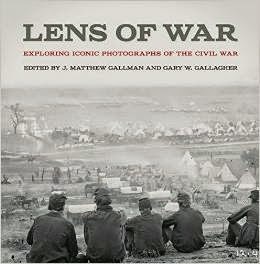 From The Publisher: Lens of War grew out of an invitation to leading historians of the Civil War to select and reflect upon a single photograph. Each could choose any image and interpret it in personal and scholarly terms. The result is a remarkable set of essays by twenty-seven scholars whose numerous volumes on the Civil War have explored military, cultural, political, African American, women’s, and environmental history. Thomas Robertson, Savas Beatie Publishing, hardcover, 192 pages, release date: April 19, 2015. From The Publisher: Despite its fascinating cast of characters, host of combats large and small, and its impact on the course of the Civil War, surprisingly little ink has been spilled on the conflict’s final months in the Carolinas. 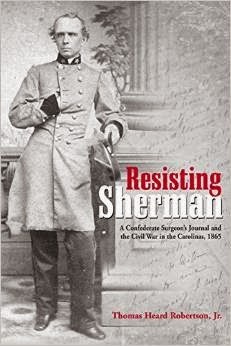 Resisting Sherman: A Confederate Surgeon’s Journal and the Civil War in the Carolinas, 1865, by Francis Marion Robertson and edited by Thomas H. Robertson, Jr.) fills in many of the gaps and adds tremendously to our knowledge of this region and those troubled final days of the Confederacy. Surgeon Francis Robertson fled Charleston with the Confederate garrison in 1865 in an effort to stay ahead of General Sherman’s Federal army as it marched north from Savannah. The Southern high command was attempting to reinforce General Joseph E. Johnston’s force in North Carolina for a last-ditch effort to defeat Sherman and perhaps join with General Lee in Virginia, or at least gain better terms for surrender. Dr. Robertson, a West Pointer, physician, professor, politician, patrician, and Presbyterian with five sons in the Confederate army, kept a daily journal for the final three months of the Civil War while traveling more than 900 miles through four states. His account looks critically at the decisions of generals from a middle ranking officer’s viewpoint, describes army movements from a ground level perspective, and places the military campaign within the everyday events of average citizens suffering under the boot of war. Editor and descendant Thomas Robertson followed in his ancestor’s footsteps, conducting exhaustive research to identify the people, route, and places mentioned in the journal. Sidebars on a wide variety of related issues include coverage of politics and the Battle of Averasboro, where one of the surgeon’s sons was shot. An extensive introduction covers the military situation in and around Charleston that led to the evacuation.